If you read my blog regularly you will know that Blake loves In the night garden and Iggle Piggle. In the night garden live. so that you can get a discount for ordering your tickets. The shows takes place in its own Showdome with plenty of toilets, baby-changing facilities and buggy parking. Which is obviously just what us parents will need. With just 13 rows of seats, wherever you sit you'll get a great view. Using a purpose built venue allows us to create a space that's completely family-friendly. See Igglepiggle, Upsy Daisy and Makka Pakka brought to life before your eyes with beautiful costumes, magical puppets, enchanting music, and breathtaking projections that make it feel like you're actually in the Night Garden. There are two different shows to choose from, one where Igglepiggle loses his blanket and one where Makka Pakka washes everyones face. Both of the shows will include all the main characters. The shows are just under an hour each and you can choose to meet a character after the show. You can book to meet Igglepiggle and/or Upsy Daisy (£15 for one character, £30 for both) when you book your tickets as well as pre-book a goody bag. Goody bags are full of exclusive In the Night Garden toys and souvenirs that you can’t buy anywhere else. The 2016 Goody Bag has a total value over £60 and contains a light-up windmill, a set of four puzzles, a hand puppet, a Tombliboo soft toy, a souvenir story book set, a drinking bottle, ‘Magical Times’ DVD and a copy of In the Night Garden magazine. Pre-booked goody bags cost £29 and they can be bought at the show for £39. I just know that Blake would love to meet Iggle Piggle and I can just picture his face light up. I am very tempted by the goody bag for the price that it is as I know Blake will love each of the items included. Tickets for the show are priced between £12.50 and £35 depending on the time and demand of the show. Every ticket includes a Souvenir Activity Brochure worth £7! 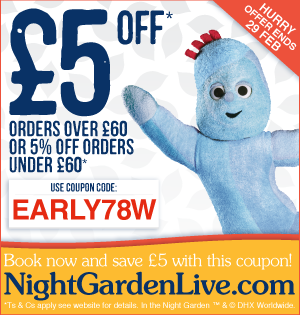 Will you be going to see In the night garden live this year?